Apple's Magic Mouse is probably the best wireless Bluetooth mouse available. But as with all wireless devices, the batteries will die eventually and you'll need to replace them. That's why it's a good idea to check your Magic Mouse's battery life before you leave home or deliver a presentation. Click Mouse. The window shown below appears. 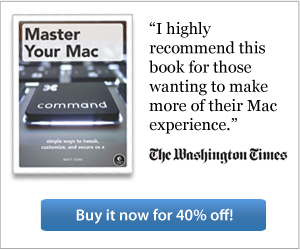 Check the Mouse Battery Level in the lower-left corner. 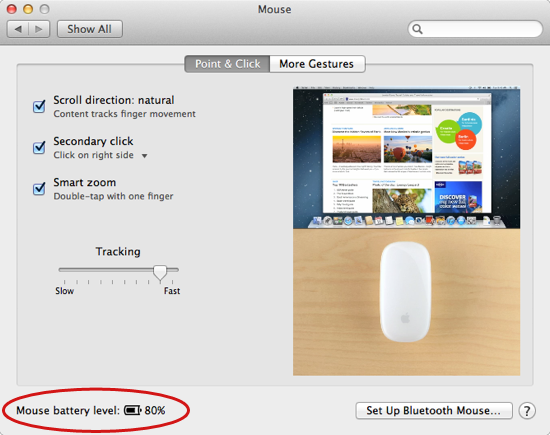 This is the percentage of battery life left in your Magic Mouse's batteries. In addition to the information in System Preferences, OS X also displays other reminders when your mouse's batteries have 10% or less battery life remaining. The Bluetooth icon will appear on the menu bar, whether you have it disabled in System Preferences or not, and it will be flashing. It's pretty noticeable. And when your mouse is about to conk out, you'll see an alert telling you that the mouse could power off at any moment.